Nearly fifty years ago, in May 1969, Rolling Stone published a Ben Fong-Torres profile about Canadian singer and songwriter Joni Mitchell, its subhead declaring that she "makes folk music hip again." Mitchell's second album, Clouds, had just been released, and she was living with Graham Nash in a cozy Laurel Canyon house with stained glass windows. As rock journalists sometimes do, Fong-Torres compared the then 25-year-old musician to a trio of better-known artists: Joan Baez, for the fluid way Mitchell played acoustic guitar; Judy Collins, due to Mitchell's ability to shift to piano; and Leonard Cohen, presumed to be Mitchell's favorite poet. 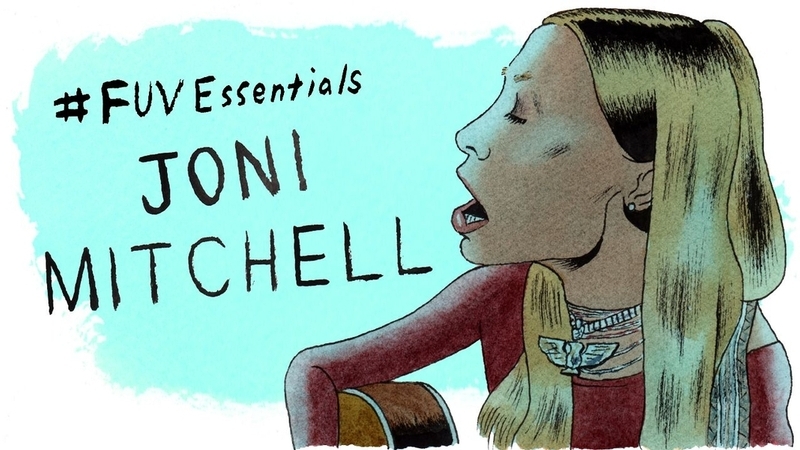 "Joni Mitchell is a fresh, incredibly beautiful innocent/experienced girl/woman," gushed Fong-Torres, also noting her collection of antique handbags, her Priestley piano and effortless ability to toss together a rhubarb pie during the interview. (It's a blessing that the phrase "manic pixie dream girl" didn't exist in 1969.) But given the dismissive, sexist review of Mitchell's debut album by another writer in the same magazine a year earlier ("Here is Joni Mitchell. A penny yellow blonde with a vanilla voice"), Fong-Torres' enthusiasm was a welcome change. Perusing that RS profile in the 21st century, a few things stand out. What's most amusing, aside from the visual of Mitchell kneading a pie crust, is Fong-Torres's earnest, explanatory comparison of the musician to Baez, Collins and Cohen; today, virtually every profile of an emerging female songwriter inevitably includes a comparison to Joni Mitchell. Whether the artist has been Laura Marling, Norah Jones, Feist, Taylor Swift, Corinne Bailey Rae, Neko Case or a thousand other women playing guitar or seated before pianos, all have been tagged over the years - rightly or wrongly - as Mitchell acolytes. What's often overlooked, when assessing fellow artists who revere Mitchell, is the infinite list of male musicians who cite her songwriting, perceptive guitar tunings, harmonics, and adventurous, uncompromising vision as their catalyst; her many fervent admirers have included Prince, James Blake, Herbie Hancock, Bob Dylan, and Rufus Wainwright. Mitchell's impact on other artists is seismic: a musician's musician, she redefined songwriting and a creative individual's need for proclivity and self-production. She found thematic parity between genders in her lyrics, musing upon relationships, romance, wanderlust, and ambition - and was even shamed for that candid scrutiny of her own life. "In search of love and music, my whole life has been," sings Mitchell on "Black Crow" from 1976's Hejira and the universality of her pursuit seems to be what draws generations of new listeners to her music. Although her early champion David Crosby would produce her debut, Song to a Seagull, Mitchell took the reins quickly as her own producer. That control was key to her evolution. Her melodies are deceptively delicate, open-tuned powerhouses of emotional complexity, sustained by the poetic incisiveness of her lyrics. Mitchell's prolific albums of the late '60s and '70s hopscotched between styles, focus, moods and forms - 1970's Ladies of the Canyon shimmered with a Sunday morning hippie cool, but a mere year later on 1971's Blue, which marked its 45th anniversary in June, she plunged into twilight ruminations of broken love and loneliness. By 1972, she was free but wary on For The Roses and edging towards jazz, a style which eventually drove Court and Spark (1974), backed by the L.A. Express. A fuller committment to jazz emerged on The Hissing of Summer Lawns in 1975. That album not only bridged the fusion of rock and jazz, but sampled the Drummers of Burundi on the Henri Rousseau-inspired "The Jungle Line." Her own misunderstood exodus, Hejira, written on a road trip from Maine to California, was a reckoning of some life decisions (briskly underlined by Jaco Pastorius's restless bass) and concluded the first half of her artistic odyssey. By the completion of those masterpieces alone, an astonishing eight studio albums in eight consecutive years, Mitchell was only 33. You could also understand her frustration and fury with the press after that triumphant marathon run too. Tossed off as a "penny yellow blonde" and a "lyrical kitchen poet" in 1968 by Rolling Stone, by 1977 things hadn't changed much: the magazine's Dave Marsh declared Hejira as "too cerebral for its own good." Like Miles Davis who had infuriated his more traditionally-minded jazz fans by embracing rock, Mitchell has willingly estranged her devotees too, following paths that still perplex her Woodstock-era, coffee shop folk fans. The jazz fusion of her 1977 double album, Don Juan's Reckless Daughter, and her remarkable, adventurous collaboration with a dying Charles Mingus on 1979's Mingus (again working with members of Weather Report, like Pastorius and Wayne Shorter, plus Herbie Hancock) were ahead of their time, provocative and expansive. But she was still reluctant to go permanently off the pop grid: by 1982 Mitchell shifted back to that genre with Wild Things Run Fast, her first collaboration with her future co-producer and husband (and eventually ex-husband), the bassist Larry Klein - an album that was surprisingly influenced by bands like the Police and Talking Heads. Chalk Mark in in a Rainstorm, released in 1988, was a sleek, all-star affair featuring collaborations with Peter Gabriel, Tom Petty, Willie Nelson, Don Henley and others, but 1991's Night Ride Home was a meditative return to the elegant jazz fusion she loved. Turbulent Indigo, which won Mitchell a 1995 Grammy for Best Pop Album, shivered with loss and laments, like the beautiful "The Sire of Sorrow (Job's Sad Song)" or "Love Puts on a New Face." She even performed latter track on "The Tonight Show with Jay Leno," not a place you'd expect to find Mitchell. Her most recent releases, 1998's Taming the Tiger and 2007's Shine, seethe with unsettled questions, global despair, and relentless self-examination, but possess flourishes of humor and contentment too. Mitchell has always been a warrior - a phoenix rising from the ashes of childhood polio, foundered love affairs, cocaine use, a fickle music industry, the pitfalls of fame and live performance, the wrath of male music journalists, and the secret of a daughter given up for adoption (they were eventually reunited in the late '90s). In recent years, she has battled grave health issues too, most traumatically a brain aneurysm in 2015. Although her current medical situation might extinguish the chance of another collection of new songs, Mitchell's breathtaking catalog of albums, released over the course of six decades, continues to instruct, illuminate, comfort and empower. At this very moment, somewhere in the world, a person with a freshly shattered heart is listening to Blue, wiping away tears and finding solace in "A Case of You" or perhaps Mitchell's greatest song, "River." Joni Mitchell will always be our confidante and our champion. She is beloved and forever one of our FUV Essentials. This article has been viewed 1,267 times since being added on July 11, 2016.